Dangerous goods - substances, materials and products that have the properties, the manifestation of which during transportation can cause an explosion and (or) fire, cause of death, illness, injury, poisoning, radiation or burns of people and (or) animals, as well as cause damage facilities, vehicles and other transportation facilities and (or) harmful to the environment. Transport of dangerous goods - a set of organizational and technological operations on the movement of dangerous goods by rail, road, water, air and other modes of transport, or a combination of such modes. The UN initiative was created ADR (Accord européen relatif au transport international des marchandises dangereuses par route) European Agreement concerning the International Carriage of Dangerous Goods, it acts on the territory of all European Union countries as well as in Kazakhstan, Azerbaijan, Morocco. In Russia it is called similar ADR. In addition to the ADR dangerous goods are also regulated in accordance with the Interim Instruction "On the transport of dangerous goods by road," the Ministry of Posts. IMDG CODE (International Maritime Dangerous Goods Code) - International Maritime Dangerous Goods (IMDG). ICAO-TI (Technical Instructions for The Safe Transport of Dangerous Goods by AIR) - Instructions on the carriage of dangerous goods by air, ICAO 9284 document. RID (International Regulations Concerning the Carriage of Dangerous Goods by Rail) - Agreement on the carriage of dangerous goods by rail. Dangerous goods are divided into classes that are based on the Model Regulations and Recommendations on the Transport of Dangerous Goods, as well as in accordance with dangerous goods properties. Explosive materials whose properties can explode, cause fire with explosive action, as well as devices containing explosives and explosive materials intended for the production of pyrotechnic effect. The main danger - a blast. 1.1 Explosives and pyrotechnic substances and products with a mass explosion hazard when the explosion instantly covers the entire cargo. 1.2 Explosives and pyrotechnic substances and products that are not mass explosion hazard. 1.3 Substances and articles which have a fire hazard and either a minor blast hazard or a minor projection hazard or both, but not a mass explosion hazard: a) combustion of which gives rise to considerable radiant heat; or b) that, burn one after another, producing minor blast or projection effects or both. 1.4 Substances and articles which present only a slight risk of explosion in the event of ignition or initiation during carriage. The effects are largely confined to the package, it is not expected fragments of appreciable size or range. An external fire shall not cause virtually instantaneous explosion of almost the entire contents of the package. 1.5 Very insensitive substances which have a mass explosion hazard but are so insensitive that there is very little probability of initiation or of transition from burning to detonation under normal conditions of carriage. In accordance with the minimum requirement for these substances, they must not explode in the external fire test. 1.6 Extremely insensitive articles which do not have a mass explosion hazard. The articles contain only extremely insensitive detonating substances and demonstrate a negligible probability of accidental initiation or propagation vzryva.PRIMEChANIE: The risk from articles of Division 1.6, limited to the explosion of a single article. Gases compressed, liquefied cooled and dissolved under pressure, meet at least one of the following conditions: the absolute vapor pressure at a temperature equal to or higher 50S 3 kg / cm³ ZOO kPa); critical temperature below 50S; short, the critical temperature below -10S; liquefied, the critical temperature equal to or higher -10S but below 70S; liquefied, the critical temperature equal to or higher 70S; dissolved under pressure; liquefied hypothermia; aerosols and compressed gases that fall under special regulations. There is the main danger, as there are different hazardous properties. 2. Do not meet the conditions of 2.1 or 2.3 Section. 2.2 gaseous oxygen. This requirement is not mandatory with respect to the non-flammable gases, if the oxygen is a liquid or gaseous state. Oxygen is considered non-flammable if it does not ignite in their properties. However, used in the combustion process. The high concentration of oxygen greatly increases the intensity of combustion and power. 2. In the absence of information about the degree of toxicity shall be considered toxic to humans, based on the results of the analysis carried out on animals, it has LC50 value 5000 ml / cubic meter. Flammable liquids, mixtures of liquids and liquids containing solids in solution or suspension, which emit flammable vapors having a flash point in closed crucible 60S and below. The main danger - fire. 3.1, having a flash point in closed crucible below Flammable liquids with a low flash point and a liquid minus 18S or having a flash point in combination with other hazardous characteristics, in addition to flammability. 3.2 Flammable liquids with medium flash point - a liquid with a flash point in closed crucible from minus to plus 18S 23. 3.3 Flammable liquids with a high flash point - a liquid with a flashpoint of up to 23 60S inclusive in a closed crucible. Flammable materials and substances (other than those classified as explosives), which during transportation is easy to catch fire from external sources of ignition through friction, moisture absorption, spontaneous chemical reactions, as well as when heated. 4.1 Flammable solids, capable of easily ignited by brief exposure to external sources of ignition (spark, flame or friction) and is actively burning. The main danger - the danger of fire and more - thermal instability - an explosion. Desensitized explosives, which can cause an explosion in the dry state and belonging to Class 1, and that given the name and shipping name and which belong to the class of hazard. Reactive substances, which are thermally unstable and undergo exothermic decomposition even without exposure to air. Combustible solids that can cause ignition by friction, with greater rate of combustion 2,2 mm (0,087 inches) per second, or metal powder which can ignite and react on the entire sample surface within 10 minutes. 4.2 pyrophoric substances, which under normal conditions of transport can spontaneously heat and ignite. The main danger - spontaneous combustion. Spontaneously combustible substance - a pyrophoric liquid or solid form, are within five (5) minutes may ignite upon contact with air or self-heating material, which in turn are subject to spontaneous combustion. 4.3 Substances that emit flammable gases. The main danger - flammable gases (eg, calcium carbide). It is dangerous in contact with water, and can be self-igniting or highlight a toxic gas with exponent 1 liters per kilogram of material within 1 hours. Oxidizing substances and organic peroxides, which can easily release oxygen to support combustion, and can, under appropriate conditions, or mixed with other substances to cause spontaneous ignition and explosion. 5.1 oxidizing agents, which by themselves are not combustible, but contribute to the easy flammability of other substances and produce oxygen during combustion, thereby increasing the intensity of the fire. The main danger - oxidation. 1. Solids Section 5.1, which after testing in accordance with UN rules are burning time less than or equal to 3: 7 burning potassium / cellulose bromate. 2. Liquid materials Section 5.1, which after testing in accordance with UN rules, have the ability to spontaneous combustion or who increase the pressure from time to 690 2070 kPa kPa less than the same period of 1: 1 nitric acid (65 percent) / cellulose. 5.2 organic peroxides, which in most cases are combustible, may act as oxidizing agents, and interact with other dangerous substances. Many of them are easy to light and sensitive to shock and friction. The main danger - thermal instability, that is, during the heating of explosion. Poisonous and infectious substances which can cause death, poisoning or illness if swallowed or in contact with skin and mucous membranes. 6.1 poisonous (toxic) substances that can cause poisoning by inhalation (fumes, dust), ingestion or skin contact. The main danger - toxicity. 6.2 substances and materials containing pathogens dangerous to humans and animals. The main danger - infection. 6.2.1.1 Infectious substances may contain pathogens. To include pathogens (bacteria, viruses, rickettsia, parasites and other) materials such as prions, which can cause disease. Note toxins produced by plants, bacterial sources, which do not contain infectious or toxic substances, which in turn are absent in infected substances referred to in Section UN3172 classification 6.1. 6.2.1.2 Biological products - products derived from living organisms which are manufactured and distributed in accordance with the requirements of the relevant authorities, and which meet the conditions of licensing and are intended for the treatment or diagnosis of both human and animal experiment or calculation method. The biological products include semi-finished or finished products, such as vaccines. 6.2.1.3 cultivation of bacteria - the result of the activities of pathogens. This definition does not refer to the samples specified in p.3.6.2.1.4. 6.2.1.4 to the samples taken from humans or animals include excretions, secretions, blood, and other components, tissue and tissue fluid samples, as well as parts of the body delivered for research, diagnosis, treatment and prevention of diseases. 6.2.1.5 Medical or clinical waste - waste resulting from a medical treatment of humans or animals, as well as bio-studies. 6.2.2.1 Infectious substances listed in Section 6.2 and have UN2814 rooms, UN2900, UN 3291 or UN3373 respectively. 6.2.2.2 Infectious substances are divided into the following categories. Infectious agents that carried a way that in case of explosion may cause disability, can cause life threatening or result in death of humans and animals. These substances include substances 3.6.D table. Note: The cause of the explosion can be the output of infectious agents outside of the protective packaging resulting in physical contact with animals or people. (A) Infectious substances that meet these characteristics and bearing a threat to the life of animals or humans, should be assigned to UN 2814 number. Infectious substances which cause disease in animals, should be assigned to UN 2900 number. (B) the procedure for assigning numbers UN 2814 or 2900 UN should be based on data from medical history and symptoms, manifestations of endemic or solving experts on the causes of the disease. 1. Proper Shipping Name UN 2814 used for infectious substances that pose a threat to human life. Proper Shipping Name UN 2900 used for infectious substances that pose a threat to the life of animals. 2. The table is incomplete. Infectious substances, including new or potential emerging pathogens that are not listed in the table, however, meet the criteria, refer to the Category A. In addition, those substances for which there is any doubt, belongs to the category A. 3. The list, to microorganisms whose names are written in Italian, include bacteria, mycoplasma, rickettsia or fungi. Infectious substances which meet the criteria for Category A. Infectious substances in Category B must be assigned to UN 3373 number. Note: The name of the transport agent under the UN number 3373 - evaluation samples or clinical samples Category B. January 01 2007, the use of the name of the transport of samples and clinical specimens is prohibited. 6.2.2.3.1 materials that do not contain infectious substances or substances for which the risk of disease in humans and animals is not regulated by the Regulations, as long as these substances will not meet the criteria of a different category. 6.2.2.3.2 Substances containing microorganisms which are not are not pathogenic for humans and animals, are not regulated by the Regulation, as long as these substances will not meet the criteria of a different category. 6.2.2.3.3 substances in the form in which the effect of pathogen is neutralized, for example, if you exclude the likelihood of a health risk, is not regulated by the Regulations, as long as these substances will not meet the criteria of a different category. 6.2.2.3.4 environmental samples (food and water samples), which exclude the probability of infection is not regulated by the Regulation, as long as these substances will not meet the criteria of a different category. 6.2.2.3.5 samples of dried blood spots obtained by the impact absorbing material to a drop of blood or the test for blood collection or blood components that have been taken for transfusion or preparation of blood products for transfusion and transplantation, as well as tissue samples or organs for transplantation, is not regulated by Regulation . (C) Brittle substances are placed in a secondary package, with each agent individually wrapped in order to avoid contact with other substances. NOTE: If any pathogens in patient samples, necessary to carry out an expert evaluation to determine whether the substance is included in the list of exceptions. This assessment is based on data from medical history and symptoms, manifestations of endemic or solving experts on the causes of the disease. Examples of specimens of samples which can be carried include blood, urine tracking cholesterol, glucose, hormones or indicators of prostate specific antigen; tests, which require assessment, for example, heart, liver or kidney patients who have no infectious diseases or clinical testing of the drug; for the purpose of insurance and employment - to the availability of narcotic drugs and alcohol; pregnancy test; a biopsy on the cancer disease; and detection of antibodies in humans and animals. (A) products which have been manufactured and packaged in accordance with specific requirements and transported for final packaging and sale, and use in treatment. Substances in this group is not regulated by the Rules. (B) products that are not included in this paragraph (a), and which may contain infectious agents and meet the criteria for Category A or Category B. Substances in this group must be assigned UN2814 rooms, UN2900 or UN3373. Note: Some licensed biological products may carry the biohazard only in certain countries. In this case, the competent authorities may require that organic products meet the local requirements, which are set for infectious substances or to impose on these products further restrictions. 6.2.4.1 Genetically modified micro-organisms which do not meet the definition of infectious substances, shall be classified under the terms of subsection 3.9. 6.2.5.1 Medical or clinical wastes Category A, which contain infectious substances must be assigned numbers or UN2814 UN2900. Medical or clinical wastes Category B, which contain infectious substances must be assigned UN3291 number. 6.2.5.2 Medical or clinical wastes probability of containing infectious substances which is low, you should assign UN3291 number. Note: The Proper Shipping Name for UN3291 - clinical waste, unspecified, or (bio) medical waste, medical waste normalized. 6.2.5.3 Decontaminated medical or clinical wastes which previously contained infectious substances are not regulated by the Regulation, as long as these substances will not meet the criteria of a different category. 6.2.6.1 deliberately infected animals in the body which can be infectious substances transported by air is prohibited until the infectious substances are transported by other means. Infected animals may only be transported under the conditions laid down by the competent authorities. 6.2.6.2 Otherwise, the use of animals with infectious substances is prohibited. 6.2.6.3 carcasses affected by pathogens Category A, assign numbers 2814 UN or UN 2900. Remains of animals infected with pathogens Category B must be transported in accordance with the requirements established by the competent authorities. 6.2.7 samples taken from patients, assign numbers UN 2814, UN 2900 3373 or UN, if the sample does not fall under the conditions p.3.6.2.2.3. 7. Radioactive substances with specific activity of more than 70 kBq / kg. The main danger - a strong radioactive radiation. The packaging label to be attached RADIOACTIVE yellow (LSA III). Some radioactive substances "special purpose" low specific activity, the label is absent, however, the packaging of such substances necessary to write RADIOACTIVE. Closed vehicle means a vehicle or a vehicle fitted firmly fixed outer shell, which limits the access of unauthorized persons to the cargo space containing 7 class (radioactive) materials. The system of containment of packagings intended to retain the radioactive contents during transport. 3. For transportation by air, any air vehicle. Design means the description Osobowa 7 hazard class (radioactive) materials, packaging, or LSA-III, which allows these elements to be fully defined. This description may include specifications, engineering drawings, reports demonstrating compliance with regulatory requirements, and other relevant documentation. In turn, the shipper wants to get the finished result and not worry about who will be engaged in freight. Priority - get quality service at a reasonable cost. Therefore, before you send the goods, the consignor must worry about the correct choice of transport organizer. However, to choose a competent and responsible professional, you need to spend time. Fissile materials - plutonium-238, 239-grade plutonium, plutonium-241, 233-enriched uranium, uranium-235, or any combination of these radionuklidov.Opredelenie not apply to unirradiated natural uranium and depleted uranium, and as such, which has been irradiated in thermal reactors neutrons. Fissile material means any cargo that contains one or more packets that have been marked in accordance with 49 CFR 173,457, index and control of nuclear criticality more than 10. Freight container means a reusable container having a volume of 1,81 cubic meters (64 cubic feet) or more, designed and built to ensure its recovery during transport. A small freight container is that which has either an external size smaller than 1,5 meters (4,9 feet) or an internal volume of not more than 3,0 cubic meters (106 cubic feet). All other freight containers are defined as large cargo containers. Calculating the number of packages that may be placed in a container or truck. Download Calculator is available for free use by our visitors. 3. 1000 TBq (27000 Key), depending on whether the value is the smallest. A limited number of class 7 (radioactive) material means the number of class 7 (radioactive) materials not exceeding the limits specified in 49 CFR 173,425 and in compliance with the requirements specified in 49 CFR 173,421. Low specific activity (LSA) is 7 class (radioactive) material with limited use that meets the description and limitations set forth below. Protective materials surrounding the LSA material may not be taken into account in determining the estimated average specific activity of the package contents. Caustic and corrosive substances that cause skin damage, damage to mucous membranes of eyes and respiratory tract, metal corrosion and damage to vehicles, buildings or goods and may cause fire in contact with organic materials or certain chemicals. 8.3 different caustic and corrosive substances. The main danger - bite (corrosiveness). The substances with relatively low risks in the transportation, are not preceded by one of the previous classes, but requires the application to them of certain rules for the transport and storage. In this class there is a dominant main danger (eg plastic, which when burned releases a strong poison - dioxin). 9.1 Solid and liquid combustible substances and materials whose properties do not apply to 3 and 4-th grade, but under certain conditions can be a fire hazard (flammable liquids with a flash point from + 60 ° C to + 100 ° C in closed vessel, fiber, and other similar materials). 9.2 substances that become caustic and corrosive under certain conditions. I - a very dangerous cargo. II - a dangerous cargo. III - slightly dangerous goods. Especially dangerous 3 class - is the ability to evaporate. Closed package eliminates the formation and leakage of vapors. In 3-class may be one major danger and maximize 2 extra danger. Class 1. The main danger. Class 2. The main danger + toxicity. Class 3. The main danger + corrosiveness. Class 4. The main danger of toxicity + + corrosiveness. Class 4.1 - Packing Group - II or III. About 5% of these substances have an additional danger - thermal instability - the possibility of an explosion (sulfur, cellulose). Class 4.2 - packing group - I, II, III. Class 4.3 - packing group - I, II, III. Class 5.1 - packing group - I, II, III (fertilizers, hydrogen peroxide). Class 5.2 - packaging group has not (raw him.zavodov). Class 6.1 - groups of packages - I, II, III. It has a lot of additional hazards (hydrogen cyanide, arsenic, mercury-containing substances, and so on. D.). Class 6.2 - no packaging groups. Class 8 - groups of packages - I, II, III. It has a lot of extra dangers. Class 9 - Group packages - II, III. (Asbestos dust - carcinogenic substances during combustion which dioxins, also carcinogens, do not decompose within 20 years). A - -Create a suffocating lack of oxygen to breathe in closed spaces (noble gases). O - oxidizing, that is promoting combustion (oxygen). Further, two or more hazardous properties simultaneously. TF - + toxic flammable. TC - + toxic caustic (corrosive). TO - + oxidizing poisonous. TFC - poisonous vosplameniyuschiesya + + caustic. TOC - poisonous + oxidizing (burning contribute) + caustic (corrosive). International Maritime Dangerous Goods (IMDG). International Convention for the Prevention of Pollution from Ships (MARPOL 73 / 78). On the basis of legal acts of the federal level, developed and approved rules and regulations for the handling of dangerous goods, which clearly regulates all control procedures, safe transport with multimodal transport of goods, storage and handling in seaports. Under Russian law for transportation of dangerous goods are permitted vessels having documents in accordance with the Rules of Maritime Dangerous Goods (IMDG Regulations). In the development of the route and the calculation of the cost of transportation is important to consider the need for additional fastening of the cargo, the loading or unloading with extreme caution, and the possibility of special equipment. Movements of dangerous goods by rail shall be governed by the Agreement on International Goods Transport by Rail (SMGS), the Convention on International Carriage by Rail (COTIF), Regulations concerning the International Carriage of Goods by Rail (RID), regulations of individual states and commonwealths. 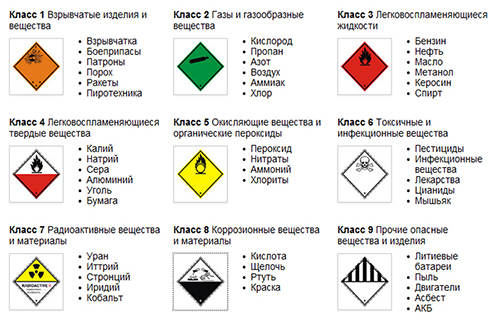 The following features of the transport of dangerous goods: a vehicle for the transport of dangerous goods must be ordered in advance (as a rule, 2-3 working days from the date of the alleged transportation); for the transport of dangerous goods need to prepare emergency cards, which are compiled on the basis of material data sheets, as well as route sheets, which indicate the routes transport of dangerous goods. The driver must strictly adhere to the routes specified in the route sheet; It is necessary to prepare accompanying documents for the transport of dangerous goods: certificates, material passport, TTN, invoices. As a rule, 3-5 days are required for registration and approval of the route for the transport of dangerous goods; When transporting dangerous goods, it is necessary to comply with the speed regime, so the fast transport of ADR cargo is not allowed; Some groups of dangerous goods are allowed to be transported together; When loading, unloading, as well as during transportation of dangerous goods, the driver is the responsible person, and therefore he is entitled to not take the ADR freight for transportation if the accompanying documentation is incorrectly or incorrectly documented, the rules for the transport of dangerous goods are not observed, Or the packaging is deformed. Labelling applied: for packages having a parallelepiped shape (including containers and packages) in the side, front and top surfaces: on the flanks - one of the ends and the shell on the two opposite sides; on bags - in the top of the seam on both sides; on bales and bales - at the end and side surfaces. Waybill must be written on the official (state) language shipper. If this language is not English, French, German, and something else in addition to one of these languages. When recording in the consignment note the name of the dangerous goods initially indicated UN identification number ... (or ANO ...) (eg UN 1256). Then recorded the full name of dangerous goods (eg nitric acid). Then specify the main class of danger (called the principal danger label number) and, if there is an additional hazard class (in parentheses) (referred to as an additional danger sign of number) - 8 (6.1), as well as indicate the packing group, if any - I. An example of a complete record: UN 1256, nitric acid, 8 (6.1), I. Packaging form, quantity and weight of the written words, for example: UN 1256, nitric acid, 3, III (drums, pieces 10, 2000 kg). An empty tanker truck, load the last UN 1230, methanol, 3 (6.1), II. An empty tanker truck, load the last UN 1203, petrol, 3, II. These records can make himself autodriver anywhere copies of the invoice of the last load. These records are required.